Do you ever have roasted veggies for dinner – onions, sweet potatoes, peppers & cherry tomatoes, let’s say – and end up with a few too many? 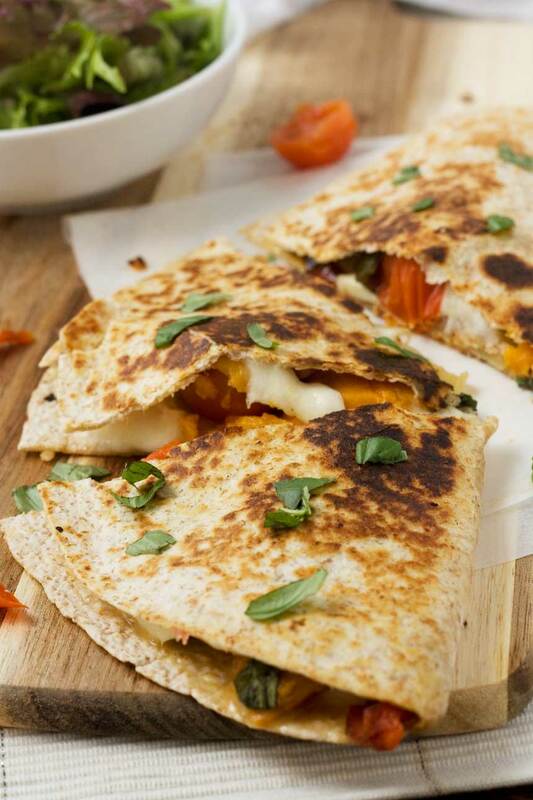 How about making some oozy, tasty quesadillas with the leftovers? 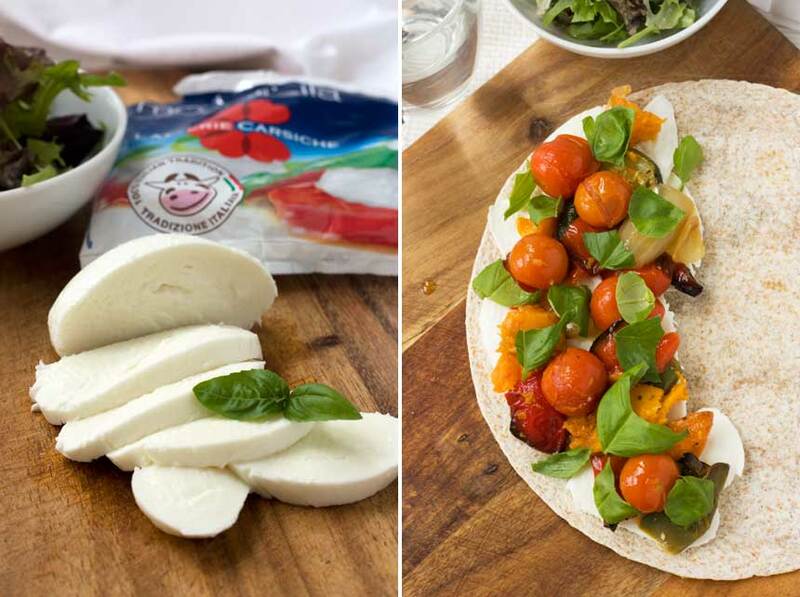 Throw the veggies onto a tortilla with some mozzarella & loads of fresh basil, fold, crisp up in a pan and you’ve got a sweet, relatively healthy and delicious cheesy snack! Jokes fly in our family about the fact that Mr. Scummy and I are always eating leftovers. I’m not sure whether this is an insult, a compliment, or somewhere in between, but it is true that we don’t like to waste any food! 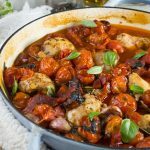 If you are like Mr. Scrummy and I and like to make good use of your leftovers, then this recipe is definitely for you. In fact, it’s hardly a recipe – just a super tasty snack or light dinner idea, really. The roasted veggies I used in these quesadillas were leftovers from our previous night’s meal – just simple baked salmon with roasted vegetables. I tend to make this meal roughly once a week because we both love it and it takes all of about 10 minutes to prepare and get in the oven. The veggies can vary according to what you like and what’s available, of course, but I tend to do sweet potatoes, red and green peppers, onion, cherry tomatoes and maybe zucchini if it’s available. I roast them for about half an hour with a few drizzles of oil, then add the cherry tomatoes for the last 5 minutes and bake the salmon separately with a bit of olive oil and pepper for about 10 minutes. I just add a bit of salt and pepper to the veg, but nothing else, not even any herbs. I find it’s just delicious as it is and doesn’t need anything else. 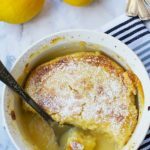 So I suppose today’s post is really two recipes in one (wow, don’t I treat you well?!) If you like salmon, give this a go some time when you’re feeling lazy and don’t want to spend very long in the kitchen. Buy some fresh crusty bread and serve with a splodge of mayo or Greek yoghurt. Yummy! AND THEN … coming to the main point of the post (!!) 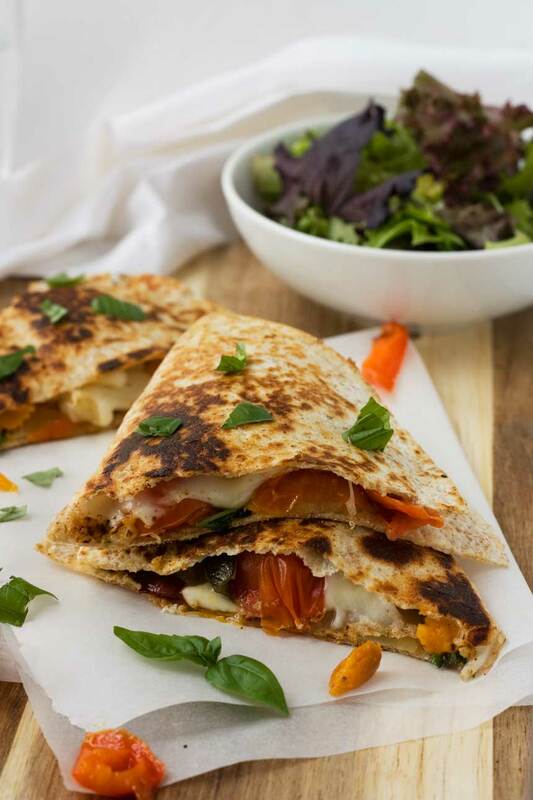 … the next day you can make yourself these just-as-delicious caprese quesadillas with roasted vegetables! As the post title reveals, the idea was inspired by the good old Italians’ deliciously simple caprese salad, which of course is just fresh ball mozzarella, tomatoes and basil. But like most Italian food, it’s sooo much more delicious than the humble sum of its 3 parts! So without any further rambling, to make these simple-but-tasty quesadillas just scatter about half a ball of torn-to-bits mozzarella over just half of a tortilla (leave the other half empty as in the piccie above), then scatter over leftover roasted vegetables (including tomatoes!) and plenty of fresh basil. Fold the empty part of the tortilla over the filling and slide into a medium-hot, slightly oiled frying pan. Cook for a minute or two or until nice and golden and crispy on the underside, then carefully slide over on the closed side to cook on the other side. If you flip over on the closed side everything won’t tumble out! But of course yours won’t end up like that because you’re going to be really SPARING with your fillings, aren’t you? Just about half a ball of mozzarella, a handful of the roasted veggies and 3 or 4 torn basil leaves is just about perfect. Two more tips for you. Tip number one: blot the veggies on some kitchen paper before you scatter them over your tortilla. This will remove any excess liquid or oil and also help to make sure you don’t end up with a soggy mess. Tip number two: lightly fry a chopped clove of garlic in a little oil, then brush a bit of the garlic-infused oil into your pan before cooking the quesadillas. This just gives a tiny hint of garlic-y taste to your finished quesadillas, a bit like you get with a proper Italian bruschetta. Mmmm! When suitably hot and crispy in the pan on both sides, slide out onto a board or plate and cut into thirds. Enjoy immediately. These are delicious by themselves, but even better dipped into guacamole and sour cream. Mmmm again! If you happen not to have any roasted veggie leftovers, then it really takes hardly any effort to roast a few especially. Or maybe you’d like to skip the assortment of veggies and just stick with simple caprese flavours instead. Fine. Just roast some cherry tomatoes for 5 minutes or in a pinch use raw tomatoes chopped in half. So do you like quesadillas? What flavour combos do you like stuffing inside them the most? 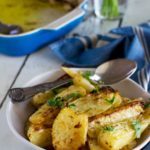 If you sometimes have leftover roasted vegetables and struggle to know what to do with them, this is the perfect recipe for you. Just scatter one half of a tortilla with mozzarella cheese, the roasted veggies and fresh basil, fold over and cook in a pan until crisp and oozy. Cook the garlic in the oil in a small saucepan for a couple of minutes to make a garlic-infused oil. Brush a bit of the oil into a frying pan and heat up on a medium heat. Meanwhile, lay out a tortilla on a large board or plate. Scatter half the mozzarella, half the roasted veggies and 3 to 4 torn basil leaves over half of the tortilla, leaving the other half plain. Fold the plain half of the tortilla over the covered half, then slide into the frying pan. Press down a bit (with a fish slice or similar) and let cook for 1 to 2 minutes or until golden and crispy on the underside. Then slide over carefully (with the closed side not losing contact with the pan) and cook for another minute or 2 on the other side. Slide out of the pan onto a board or plate and cut into thirds. Repeat with the other tortilla and ingredients, then serve immediately while still hot and crispy (with the guac & sour cream, if using). Use any roasted vegetables you like, of course, but I like to use sweet potato, onion chunks, red and/or green peppers and cherry tomatoes. Don’t forget the cherry tomatoes, because without them these aren’t really caprese quesadillas! If you don’t have any leftover veggies, roast some especially! Just roast for about half an hour at 200C/390F. Add the cherry tomatoes just for the final 5 minutes. Helen, these quesadillas look amazing! I could eat these just about every day, as they’re one of my favorites. I love the roasted veggies in here! So perfect for spring and a healthier meal. Thank you so much, Gayle! I adore the taste of roasted veggies … so sweet … so I thought I’d try to up the deliciousness factor a bit more by adding cheese and basil. I figured I couldn’t fail! Beautiful!! I love the tip to fry some garlic before making the quesadillas! I love caprese too! 🙂 A perfect meatless meal!! 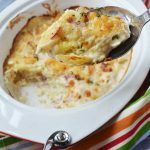 Leftovers are great and it is fun to think of ways to use them up. I always feel so proud of myself when I do it well. Not always so but this looks a way to go with them! Thanks, Helen. Yes, I totally agree with you, Lori. 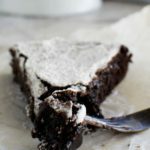 I don’t always use my leftovers all that successfully, but I’ll definitely be making these again. 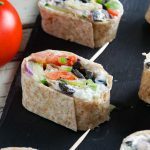 I’m always drooling when I visit your blog Helen 🙂 🙂 🙂 These quesadillas look so delicious! Need to make them, my husband loves “caprese”! Pinned! All my favorites all together. I love this and I’m going to try it. I wish I could simply reach into the screen and grab one out! They look mouthwatering. Glad you feel that way, Angie!! And thanks so much for passing by and taking the time to comment. Great to ‘meet’ you! Lol! We eat lots of leftovers too :0 I think it’s compliment that you don’t waste food!! Also..these are amazing! I love caprese ANYTHING, Helen, so that got me right there! Then you threw in some delicious roasted veggies and made these even better. I love the new look of your site, too! I know I’ve been here before since you did it but I’m finally getting around to telling you. 🙂 Pinned! Aw, thanks so much, Marcie! I actually only made a couple of small changes to the site, just the header and the colours, but I’m liking it so far! Really happy you like the quesadillas, too. It’s amazing how tasty what is pretty much just cheese and tomatoes can be, isn’t it? That’s the Italians for you! Thanks for pinning, too! I simply love your tips on blotting the veggies dry and sauteing some garlic in a pan before cooking the tortillas! Helen thank you – I love how such easy tips make such a huge difference! 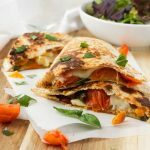 My daughter and I eat a ton of leftovers too – just easier sometimes than cooking every night – I usually throw veggies with quinoa or rice – but this quesadilla is a great idea! These quesadillas look divine! 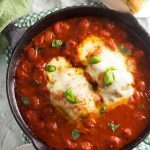 Love the fusion between Mexican and Italian here – you’re always so creative, Helen! 😀 Can’t wait to try these! Thank you so much for that lovely compliment, Jess! So are you! I love all your beautiful baking creations! I love love love quesadillas and a caprese quesadilla is brilliant! Yum!! Thanks, Rachel! Tomorrow I’ve got leftover noodles … yum!! Thank you, Gwen! Glad you like these quesadillas. Thanks so much for passing by, too! This is so great Helen! We’ve always got tons of leftovers too, and now I know just what to do with them. Thanks for the great idea! Oh, you’re welcome, Allie! Glad to have been of assistance! Helen I adore recipes that are lunch worthy. These caprese quesadillas are beautiful and full of flavor. Thanks, Kathy! These do indeed make a very tasty lunch! Somehow I always forget about quesadillas when I’m trying to figure out what to make for dinner even though we almost always have all of the ingredients to make them! Love that these use up all those leftovers. Yeah, me too! I guess they are one of those things that you would always have the ingredients for so long as you have tortillas. Glad I reminded you of quesadillas, Joanne! Oh boy. You TOTALLY nailed this one. I want to dive in and grab a piece. Check out that crispy crispy crust and gooey melted cheese!! Glad to have had that effect on you, Nagi! They did turn out rather nice and crispy, I must say! This “Dillas” look absolutely fantastic! Ready to devour. Oh how I wish I had leftover roasted veggies, where do they all go? So tasty! Well, I think I’ll excuse you, Laura, as I know you have quite a family to feed! Still, if you ever feel like a quick quesadilla snack, these are so easy to throw together for a crowd. 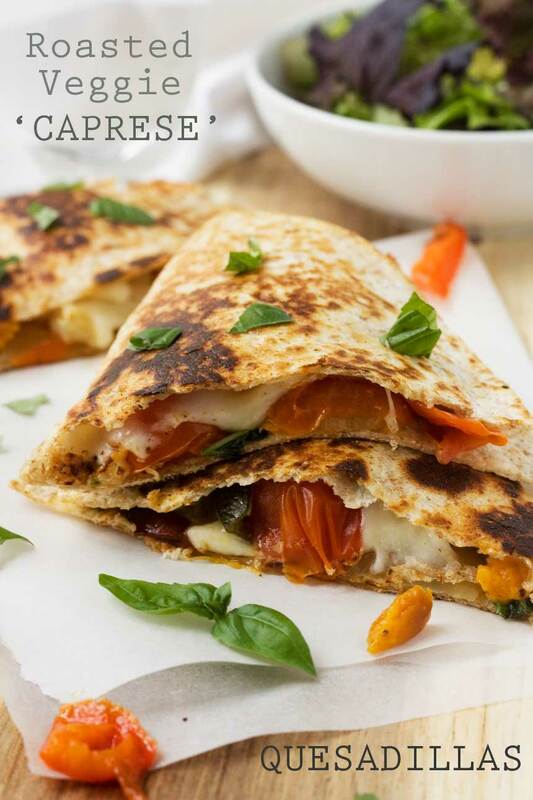 You can just make caprese quesadillas if you like and skip the veggies if you don’t have any! 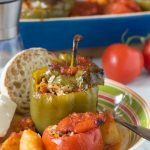 I love recipes that make use of leftovers – I feel like half of my meals are leftovers 🙂 But what a wonderful way to reinvent a dish! And I absolutely love the photo of those gorgeous tomatoes on one half of the tortilla – I could frame that! Aw, thanks, Kathleen! I actually had an even nicer photo of the tomatoes on the tortilla (more at eye level) but it was a pic of the one that I piled too many ingredients on. Thought I’d better not show that one!! Las quésadillas..mmm j’aime beaucoup, le tiennes j’adore ! Les câpres, la mozzarella… tout y est pour un dîner parfait ! J’aime ta nouvelle présentation du blog ! Thank you, Medha! I didn’t think of it like that. So I DO have a recipe for cinco de mayo! We used to get quesadillas like this at the farmer’s market and I haven’t had anything like it for ages. 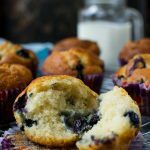 These look perfect and I’m definitely going to try your recipe! Oh, that would be wonderful to be able to buy food like quesadillas at a market! Really happy you want to try making these, Marissa!